I got a 2010 hyundai accent blue. Clutch is down, battery has plenty of juice. I turn the key (clutch down), dash lights up as usual, one click and no turnover. Clutch switch seems ok, I had the ignition replaced recently, battery is ok (had it tested). My gut would say bad starter, what do you guys think..? Should i replace the clutch switch first to make sure before a go after the starter? You're probably right about the starter. If possible try to have someone tap on the starter while someone else tries to crank it. 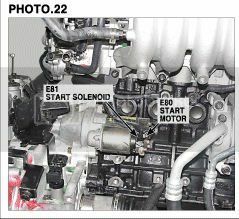 If that makes the starter suddenly engage, that would confirm the bad starter. Update....I jumped it = didn't work. charged it = didn't work, took battery to autozone = they load tested everything fine. Looks like it's hammer time. Anyone know where I can find this elusive starter? It's seems to be hiding on me. Oh by the way, I'm in CT, it 11 degrees here but "feels like -2" according to the weather service. It's on the backside of the engine under the intake manifold.